Help! My baby has a funny shaped head. 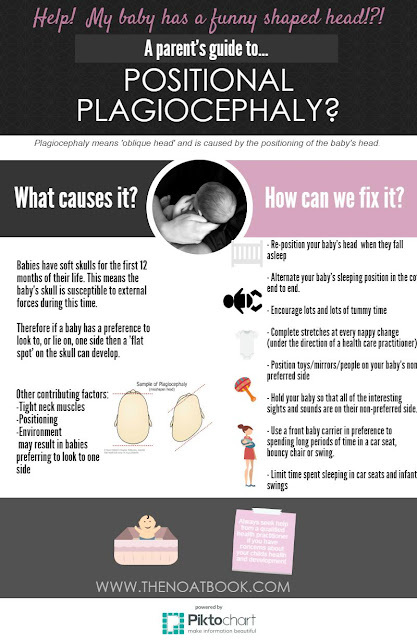 A parent's guide to plagiocephaly. Your beautiful baby is almost one month old and you have successfully navigated your way through the first few weeks of feeding, crying and sleep deprivation. But as the haze starts to lift you notice a small bald patch on your baby's head. Initially, you don't think much of it, but a few weeks later you realise the bald patch is a little bigger and you think that your baby's head may be starting to flatten out in the same area. You look at your baby on the floor and think maybe they also prefer to look to one one side more often than not. You start to notice it more and more and soon it's all you can see when you look at your baby's head. You begin to worry that something is wrong and so you start Googling 'My baby has a funny shaped head' and you find yourself here! First of all, breathe out and relax a little, it is going to be okay. It is actually quite a common issue and it can be fixed. It has a name, it's called positional plagiocephaly, and most importantly, let me be clear from the start, it is not causing any damage to the development of your baby's brain! Plagiocephaly means 'oblique head' which is caused by the positioning of the baby's head, hence it is call positional plagiocephaly. It presents as a flat spot on the back or side of the head. A 'flat spot' will develop if one part of the baby's head is kept in frequent contact with a hard surface (such as a the floor or a car capsule). If a baby has a preference to look to, or lie on, one side then one side of the head will have more constant contact with the floor and so a 'flat spot' on the skull can develop. The baby will then find it easier to continue to rest their head on that flat spot which makes the problem worse and the cycle continues. The extended use of car seats, bouncy seats and infant swings can result in a baby's head resting against an hard surface for a long period of time. While normal use of these very helpful devices is not a concern, extended use can increase the risk of your baby developing plagiocephaly. Developmental delay can also make it harder for a baby to move or turn their head and may also increase the risk of developing plagiocephaly. SID prevention strategies, such as back sleeping, have been very successful in reducing the rate of deaths from SIDS and should always be followed. 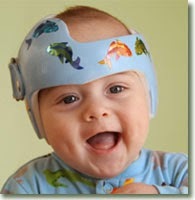 However as a result, the number of babies developing positional plagiocephaly has also increased. Why does the skull flatten? During their delivery, a baby has to overcome the ridiculous challenge of navigating their disproportionately large head down a very narrow birth canal. This can only happen if their skull is soft and able to mould and move to fit the small amount of space available. This skull softness remains for the first 12 months of their life to accommodate their rapid brain growth which also means the baby's skull is still susceptible to external forces during this time. This is especially true for premature babies as their skulls are less developed and softer and their medical management means usually means they spend a lot more time on their backs. Imagine a balloon filled with sand lying on a table - the part of the balloon that is in contact with the table will slightly flatten due to the external pressure exerted on it by the table. Why does my baby prefer to look to one side? A baby can develop a preference to look to one side for a number of reasons. During the last few weeks of pregnancy, babies can run out of space and can end up stuck in positions that cause their neck muscles to tighten on one side and so the baby may develop torticollis (see below). This means the baby will find it more comfortable to look to one side when they are born. The baby's head may have also rested against their mum's pelvis (or a twin) during this time and therefore they may have started to develop a slightly flattened even before they are born. Torticollis is a 'twisted neck' muscle. If your baby has developed torticollis it is a good idea to ensure your baby's hips are also checked for developmental dyspalgia as they are sometimes related. Positional plagiocephaly will not impact on your child's brain growth or development. . However it can result in asymmetry of the face. The human eye is drawn to symmetry and so this can make a baby's face look 'odd' and it is something we want to try to avoid. The asymmetry of the ears can also make wearing of glasses more uncomfortable and the flat spot itself can be noticeable if children choose to shave their hair as they get older. So while these are mainly cosmetic issues, they are still, nonetheless, issues we would choose to avoid where possible. Will it stay like this forever? With time alone there will be some improvement due to the relative size of the child's head decreasing, hair coverage increasing and as the baby becoming more mobile they will naturally spend less time on their back. However in order to avoid facial asymmetry the earlier you can address any issue the better the results. 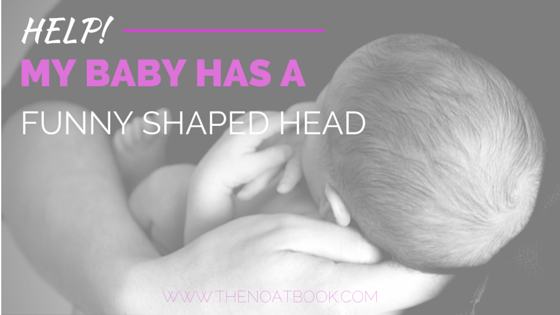 How can I tell if my baby has positional plagiocephaly? Stand behind your baby while they are sitting on someone else's lap with their back to you. Place a finger in each ear and look to see if one finger is now more forward than the other. If so, look to see if this also corresponds with the forehead on the same side also sitting slightly forward and looking more prominent. Re-positioning, re-positioning, re-positioning (also called counter positioning). - limit time laying on back. - hold baby so that all of the interesting sights are on their non-preferred side. - if your baby has developed a flat spot it can be helpful to use front baby carrier in preference to spending long periods of time in a car seat, bouncy chair or swing. Encourage tummy time as this is the best way to increase the strength of your baby's neck muscles. As your baby's neck strength increases it will be easier for them to them to reposition their head themselves. Try to always start floor time by placing you baby on their tummy and try to increase tummy time by 1 minute every day. Tummy time does not have to be restricted to floor time. You can hold your baby in a prone position, or soothe them while they lie over your lap. I'm doing all of these things and it's not getting any better. What else can I try? 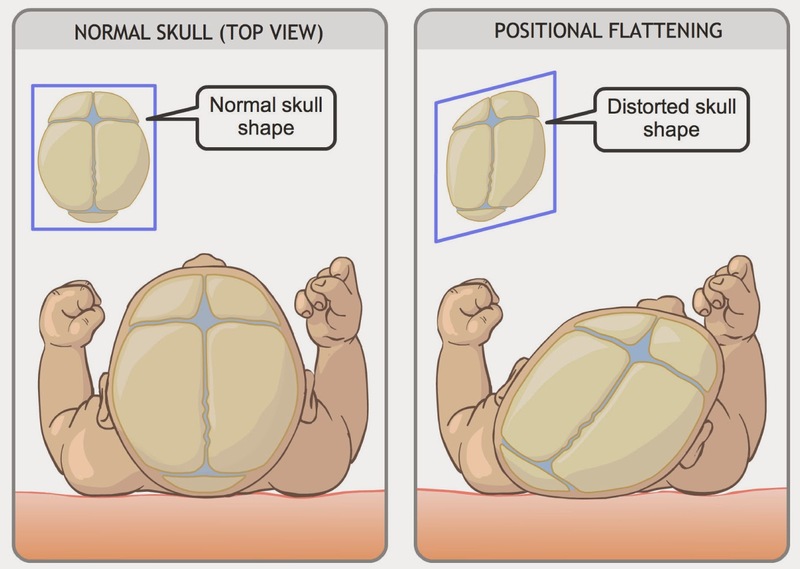 Occasionally an infant's skull is significantly misshapen and does not respond to conservative measures such as re-positioning and stretching. In these instances your baby can be referred to a specialist clinic to be assessed for their suitability for Infant Helmet therapy. A helmet is custom made by an orthotist and it is worn for 23 hours a day for several months. It aims to take pressure of the flat area and apply gentle counter pressure to surrounding areas to encourage symmetrical growth. It is not required very often and is often associated with other conditions such as torticollis. Can it be anything more serious? In some rare cases it can be a sign of synostenosis which is a more serious condition involving the premature fusing of the cranial bones. For this reason you should seek the advice of a registered health care professional. In Australia paediatric physiotherapists are generally the health care professional of choice to treat positional plagiocephaly. My husband and I usually have to organise separate exercise sessions so one of us can look after the the boys. This week we were lucky that everything aligned and all four of us were able to do a session together - I love watching the boys try to copy our moves, however the extra weight climbing onto my back while I'm trying to hold a plank is not so great! Hubby designed the session and here is how it went down. We started with this first circuit. I used a 12kg dead ball, a 16kg kettle bell and a 30kg barbell. These were heavier weights than I would normally select for myself so it was a good change up. The farmer's walk challenged my grip strength as this is not a usual exercise for me and I definitely felt the extra weight in the dead lifts! and 100 reps of varied abdominal exercises. 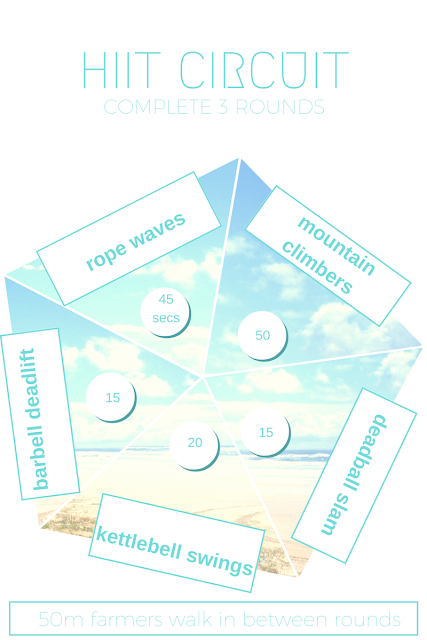 It's a workout that requires a bit of equipment so is best suited to a gym. It was fun and I recommend working out with your partner as a way to mix it up and keep you motivated!